We've published Nancy's work here at KotaPress in the recent past, and I was very excited to hear that she had published this chapbook Of My Soul. Upon further inquiry, it was also a wonderful discovery to find that this chapbook will be incorporated into a larger collection to be called Of Ways Of Looking At A Woman which will also be released from Rosecroft Publishing soon. Of course given my own life circumstances, it's always the grief and healing poems that speak to me the most. Nancy's poem title "Grief" in this chapbook is beautiful and to the point. "I wear my grief like a security blanket/...So I pull it up around my chin/...to/Relieve my chill and hope for the day/I can recall you without a tear." To any bereaved person, you know how thick the blanket of grief can be, and you'll find metaphor like this throughout Nancy's writing. So many of Nancy's works remind me of those unforgettable in-the-body experiences that are so overwhelming yet simple and almost overlooked in our day to day lives. In "Recall" she writes, "I stood in the shower. Beads of steaming hot water/pelted my back like ammunition to numb the pain." How many showers have we all taken like this? Maybe your pain wasn't from the death of a child. Maybe you lost a job or got divorced. But the loss is loss is loss. And this kind of in-the-body writing will speak to you no matter what your particular life experiences. She also does this kind of thing in "My Dad" and "Extinction" both. and took downold feelings and memories. You can imagine how this stanza spoke to me as a woman whose child died at birth, a woman who had to dismantle a nursery in a very untimely manner. And yet the loss Nancy addresses here was not the same kind of loss. You just simply need to get your hands on a copy of this book in order to unearth the layers of meaning waiting here for you! 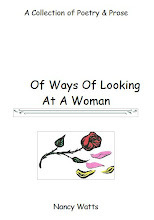 From the book "Of Ways Of Looking At A Woman"
Of Ways Of Looking At A Woman is that and much more. Nancy Watts dubs this her first book of poetry but one would never guess that. A year ago, as a New England Writers member, she began sending me her poems for mentoring. She saved up quite a few and has that unique gift of being able to write a poem on demand, which she frequently does of herself. Studying to finish her degree and raising two children is part of the discipline that has gone into her first book of poetry. We not only see finished work, but the poems are gut feelings when a young friend dies or how she feels about her own children. Facing challenges, she steps up to the plate and does some of her mentor’s new BRIK poems. The results are more than being a housewife they are more Ways of Looking At A Woman. What the reader sees is much that is delightful. But to whom will it belong in the end? To make me feel alive.